We get it. It’s difficult to know if you’re hiring the right vendor when they speak a language you don’t speak. That’s why we put together this cabling 101 guide. 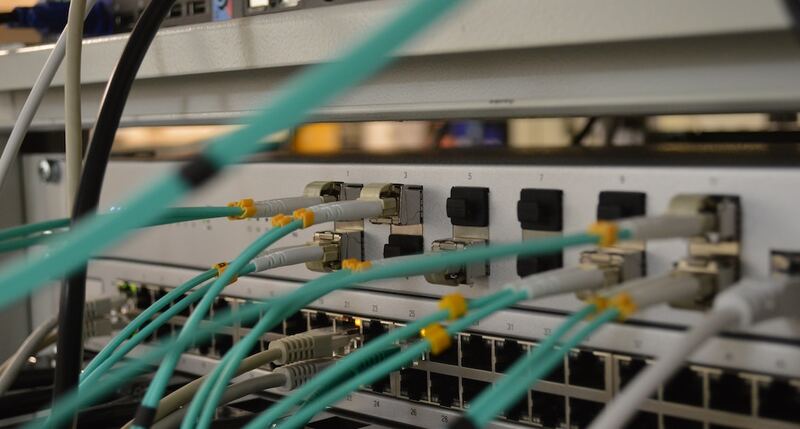 Whether you are moving to a new space that is already built out, a space you’re building out, or it’s simply time to upgrade your network cabling, this cabling basics tutorial will help you make the best decision for your business. First, what is cabling? Cabling refers to connecting any of your electronic devices through a data transfer medium. The right method and types of cable for your business really depend on the type of network you need: are you running audio/visual in the conference rooms, do you need bandwidth for online meetings, or do you just need the phones and computers to work? Before we can discuss the best type of cable, it’s important to know the terms associated with your network. Server: a dedicated computer that provides data to other computers. Network Switch: This is the device that allows computers, printers or other devices to talk to each other. Data Cables: This is how data is transferred within the network. End Devices: All of the computers, printers, audio/visual components, and phone systems in the office. Plenum cable – this is a type of cable that is usually always required for cabling inside an office that has an air duct return. DMARC – This is the exact location where your Internet Provider will install or hand-off your internet circuit. This is usually in a common network closet in your building typically located on the first floor or basement. Extending the DMARC – Sometimes the Internet provider will install a cable from the DMARC but sometimes you must do so yourself. AV Cabling – Audio Visual Cabling or the cabling of items used for sound, display, projection of video – things typically found in a conference room. There are two main types of cables that provide Internet connectivity to your office from a carrier. Externally, your cable company will be running either coaxial or fiber optic cable to the building. You need to know which one it is because that will impact the choices you make in your office. Coaxial Cable is the cable that provides “Broadband” service. Broadband service is typically not symmetrical service meaning that your download speed is usually much faster than your upload speed. This is something to consider. Broadband is normally a shared service where a large amount of bandwidth is segregated off to multiple tenants or organizations. Also broadband requires power to transmit its signal. Fiber Optic Cable is symmetrical service meaning that your upload speed is the same as your download speed. Also, fiber is one of the fastest and most secure cabling options. It can transmit data over the greatest distance since it is light that transmits the signal. However, it is also fragile and expensive to install. Do not assume that the office space you are moving into has fiber optic cable because that is not always the case. Within your office and your network, you have the choice of UTP or STP. Unshielded Twisted Pairs (UTPS) are the most common and most affordable, and likely what you will be using. There are six categories, with CAT-1 being the lowest amount of data transmitted per second and CAT-6 the highest. For your office space, you’ll be looking at CAT-5e, or CAT-6. CAT-5e (Category 5 enhanced cabling) supports 1Gb and cuts down on crosstalk, which is the interference that sometimes happens with wires inside the cable. CAT-5e is still currently a popular cable to install in offices since most network switches transfer up to gigabit. CAT5 is generally 15-20% less expensive than CAT6. CAT-6 includes improvements over its predecessors, with even stricter specifications when it comes to interference. It is capable of 10Gb speeds in some cases. CAT6 is an excellent option for cabling offices and network devices. CAT6 is more expensive that CAT5e however for future planning of network switch speed and peripherals it is a safe decision. Shielded Twisted Pairs (STP) are like UTPs, but also have a shielding element to protects them from electronic interference. Hospitals and other buildings that have machinery that produces noise typically use STP. Most business can run on UTP, but the best option for you is something to discuss with your cabling expert. As you can tell there are multiple factors in regards to determining what cable is right for your business. We at Bailey Systems can assist you with this decision. Book your call today.